Vintage Japanese Mosaic Celluloid Picks! I was surfing eBay last week to see what was out there in the vintage celluloid pick market, and saw these mosaic celluloid picks. I love the look and I had to have them. Celluloid is getting harder and harder to find for pick manufacturing, so I figured I better scoop up what I like before they are all gone… These appear to be the D’Andrea No. 346 shape or the Herco No. 35. Mosaic celluloid was used for Herco picks by their Japanese manufacturer when their “shell” colored celluloid wasn’t available. Herco later asked their manufacturer not to substitute the assorted color/mosaic celluloid except for their thumb pick. I guess the assorted colors didn’t sell well at the time, with the Herco thumb pick being the exception. They sound similar to a Fender celluloid pick, but look way cooler. Very Rock and Roll! The Gravity picks I ordered showed up in the mail yesterday. I ordered the mini size for all of them. I wish I would have ordered one size up for at least one pick for a little bit more to hang on to. I ordered the Tripp model and the Stealth. Chris Fahey Master Picksmith at Gravity sent along an extra pick called the Sunrise Mini 3. The Sunrise totally surprised me. First impression… The Sunrise pick is smokin’ hot for playing rock music. I mean Smokin’ HOT! I will write in-depth reviews for each pick in the coming weeks after I have some time to get familiar with each one. Chris Fahey, thanks for sending the free Sunrise pick along with the others. What a pleasant surprise I found in the Sunrise. 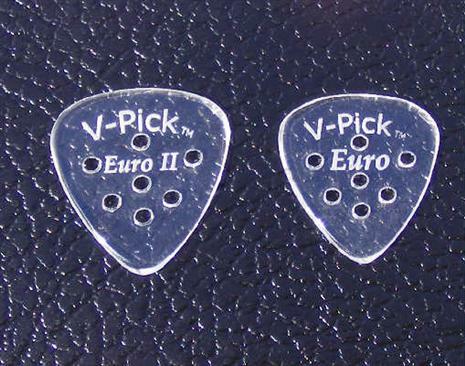 V-Picks Euro and Euro II Review Coming Soon! I picked up a couple of V-Picks today from one of their dealers I happened to be near today. They don’t have many dealers in this area yet. The models I decided to give a thorough work through after trying several of their models in the shop are the Euro and the Euro II. They are the same pick material just different sizes, which does affect how you use them. After a couple weeks of testing I will write a full review. Stay tuned! 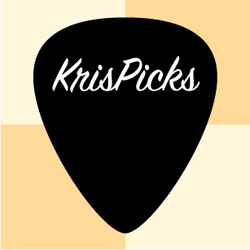 This is the pick that started it all… It is the pick I first used when I started playing guitar. Actually, it was more like trying to play the guitar and making plenty of noise. I know I drove my Mom crazy. 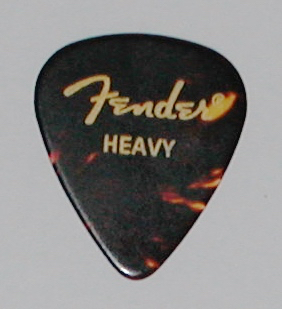 I think it is safe to say every music store that sells guitars sells Fender picks, so you can get these quite easily at any music/guitar store. They are inexpensive, and the celluloid material is quite soft. These picks wear down quickly and the thin and medium gauges tear quite easily. I used these picks because everyone else was using them at the time. Hey, I didn’t know any better, and Randy Rhoads used a Fender Medium. That was good enough for me! Nor was there the huge selection of picks in the late ’70’s early 80’s like there is available to us today. I used the medium gauge for several years. When I went away to college a friend of mine who lived in the dorm room next door, who was a very good guitar player, suggested I switch to the Fender Heavy instead of the Fender medium. He said I would be able to play faster and more accurately with the Fender Heavy, since it did not bend as much while playing. I considered this and split my time between the medium gauge and the heavy gauge to see what worked best for me. I ended up moving to the Fender Heavy gauge exclusively until somewhere in the early 2000’s. The celluloid material these picks are made from is very smooth, which allows these picks like to move around when you are playing. They are also fairly easy to drop when your hands start to get sweaty. Some people would glue cork or sandpaper to their picks to make them easier to hang onto while playing live. I always had plenty around, so I would just grab another one if the pick happened to fly uncontrollably out of my finger’s grasp while playing live. 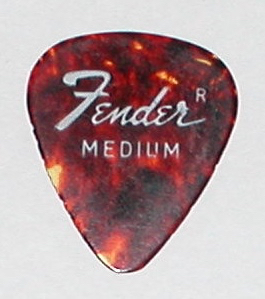 Fender celluloid guitar picks are available in four colors. How do they sound? The Fender celluloid picks produce a nice warm, rounded tone, and create plenty of pick flap against the strings while playing, especially when using the thinner gauges. This gives you the classic celluloid pick sound. Celluloid picks have a sharper attack against the strings than the Gator Grip picks do, and sound a tad brighter too. With a distorted amp tone playing some first position cowboy chords it almost sounds like a motor is running with the chord. Kind of like when you clothes pinned playing cards into the spokes of your bicycle wheels when you were a kid, but not exactly. The lighter gauges are great for rhythm work and the heavier gauges are better for lead work and super fast thrash metal type and/or high speed rhythm playing. If you are on a tight budget Fender celluloid picks are great to start out with, and do produce a very nice tone. 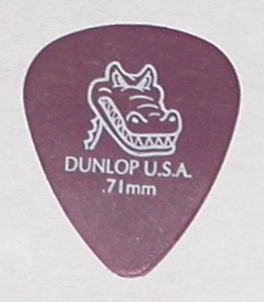 The next pick we are going to talk about is the Dunlop Gator Grip pick. I use these picks for both electric and acoustic guitar playing. The gauge I use the most is the .71 mm pick. They are an opaque purple color. Each gauge is a different color. This pick is an excellent pick for rhythm playing and some lead playing. 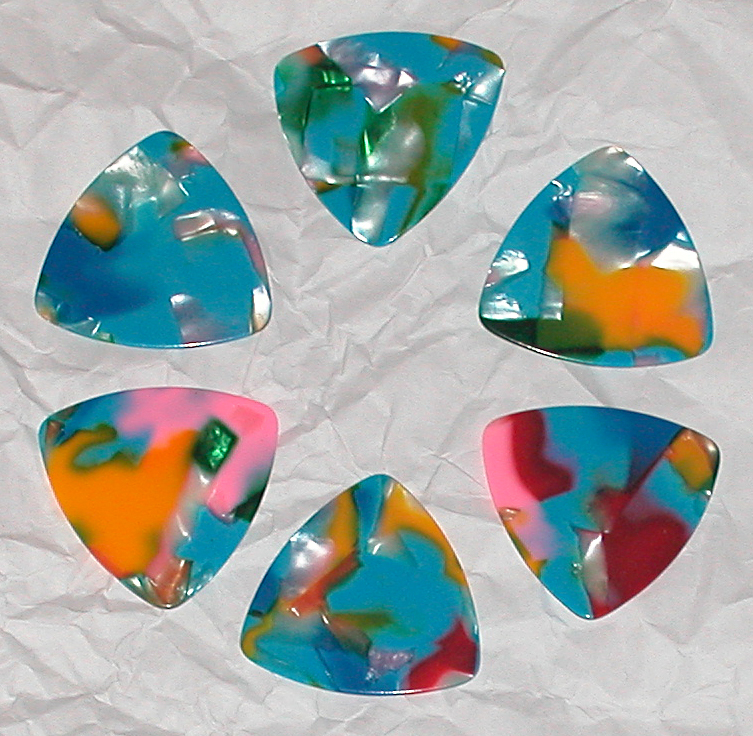 These picks are made out of a plastic called Delrex, which is similar to Tortex. When the picks are new they are chalky looking as you can see in the picture, and are very grippy. If you sweat a lot you may want to use Gator Grips picks as your main guitar pick. You will be hard pressed to drop one in the heat of battle. The edges are beveled for quick string release and smooth playing. What does this pick sound like? It sounds totally different than Ultex picks that’s for sure. The Gator Grip pick produces a warmer, darker, fatter tone than Ultex. The .71 mm gauge kind of flaps against the strings while you play, so you get added vibe from the pick while playing rhythm and lead. When playing lead I really choke up on the pick to stiffen it up a bit for quicker pick response. This pick gives the notes an added whirr and blur that most other picks just don’t add to the sound. Single line passages just flow and blend together in a very musical way when using this pick. I played with another guitarist a while back, who borrowed one these picks from me. He just smoked with this pick and his tone was glorious. For a while I was hooked on this pick for electric guitar playing, before Ultex® won me over for most styles of music I play (please see my Ultex® Jazz III review). When I want more drive and projection out of my acoustic guitar I switch to this pick or the blue .96 mm Gator Grip pick, and hit the strings hard with downstrokes. I have tried all of the gauges except for the red .58 mm gauge. The purple .71 mm is by far my favorite gauge of the Gator Grips. The lighter gauges of these picks tend to wear down faster than Ultex, but if you like a smooth, fat tone Gator Grips are the way go. Highly recommended.